← Senator: Which Part Of “Too Big To Fail” Do You Not Understand? Stung by the hard-hitting critique of Senator Ted Kaufman earlier on Friday and unsure exactly where an increasingly combative White House is heading on the broader strategy vis-à-vis banks, Mr. Dodd took to the Senate floor yesterday afternoon – actually immediately after Senator Kaufman – in an attempt to sustain the momentum behind his approach to “reform”. Senator Dodd asserts that “never again should a financial problem of a major financial institution put the rest of the country at risk”. But there is no mention of the specific reforms that would prevent this. But the cognitive dissonance here is extreme. The only purported mechanism to rein in megabanks in the Dodd bill is the resolution authority, but this by definition cannot work for large complex cross-border financial institution – this is the point insisted upon by Senator Kaufman today. Dodd recognizes the validity of Kaufman’s argument at some level, but just cannot bring himself to say that he agrees – or to acknowledge that his legislation does nothing to deal with financial institutions that have already proved themselves to be so large they can damage society. So we reach an impasse – at least for now. Dodd concedes that too big to fail is the central issue and he implicitly acknowledges that his bill has no way to address the concerns raised by Senator Kaufman (and Paul Volcker and others). The White House has cleared the way for major progress vs. the financial sector lobby (nice speech by Neal Wolin to the Chamber of Commerce), but does not yet press home its advantage. Barney Frank knows there is a deep flaw in the current legislation and waits in the wings with a sharp pencil. He previously thought “too big to fail” firms could be taxed down to size; increasingly this seems unrealistic and at odds with the shifting consensus on systemic risk. Chris Dodd wants to go out in blaze of glory, not with a bill that makes no sense at all on its most critical points. Ted Kaufman is turning into a relentless critic, Elizabeth Warren is fast becoming a folk hero, and Paul Volcker is poised to make a major speech in Washington on Tuesday. Is Volcker likely to toe the party line and defer to Senator Dodd – or will he lay out in forceful terms what reforms would really mean, i.e., what are the true Volcker principles, who has them, and how would you know? Financial reform might make for good television after all. This entry was posted in Commentary and tagged Senator Dodd, Senator Kaufman. Bookmark the permalink. One wonders who, exactly, Sen. Dodd is protecting. And what the payoff looks like after he’s retired. Obviously getting into former Senator Phil Gramm’s cha-cha line. Isn’t it interesting that we have known and even taught in major University textbooks for years that Oligopolies are dangerous, yet 99% of University economists are saying nothing against TBTF??? It’s as if American Economics professors have been struck with a magic wand and become deaf, dumb, and blind. I agree that the size of an institution can make it much more difficult to ‘resolve’ and that such institutions can take outsized risks – risk rates increase with increased size. 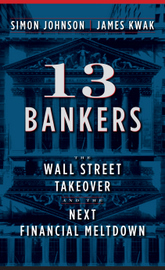 How would shrinking the 10 biggest banks to the level James usually recommends – $250B – occur in practice? The 10 largest bhc’s have ~$10T in assets, so we’d need to go from 10 banks to 40, creating 30 new very large banks. That’s a non-trivial task. Then, how would you resolve a failure of a $250B bank? Our example could be WaMu (or Bear). They got eaten by another big boy. How would we do it differently? If a $250B failed, it would take another $250B to absorb, instantly creating a $500B. Outsized profits are generated by new business (orig fees), so this guy would be stuck not being able to write new business. Eliminate all off book transactions by all companies. Who knows what is hiding in these transactions? How can any bank be wound down if you don’t know what is on the books? How do you know if a bank / insurance company is systemic if you do not know the extent of their derivatives? Who wants to invest in a company with two sets of books? Why is Senator Kaufman taking an ethical leadership role about an industry which is in Schumer’s backyard? I appreciate you staying on this case. Somebody has to keep these big feet in the fire until they holler “OK. I’ll do the right thing! Why can’t they reinstate the Glass-Steagall Act? If one wants to get really serious about financial reform, Glass-Steagall definitely should be re-instated, since it has served us so well over the years. If it is too great of a task to limit the size of the “big banks”, then the government should state that it will not provide financial assistance to them of their clients should they fail. Banks should be required to maintain at least 50% — if not more– of their assets in reserve. More attention should be given to regulating those investment instruments (derivatives, credit default swaps etc.) that have caused all of the problems, making sure they are trade publicly in a transparent manner. Yes, why not reinstate the Glass-Steagall Act? Would G-S have prevented the 2008 economic meltdown? If yes, which is more important to society: Using G-S to prevent another financial crisis that might ruin the economy or keeping G-S buried to maximize creative economic activity to mazimize profits? The payoff is coming from the too big to fail banks no doubt. Dodd has nothing to lose he’s outta there anyway……someone else should be in charge of this reform bill. No, its not a magic wand, they just keep drinking the cool-aid of wanabe ‘conservative economists’, no matter how radical that might be in these days of massive obscure instantaneous multinational capital transfers. “Too big to fail” is a big deal. 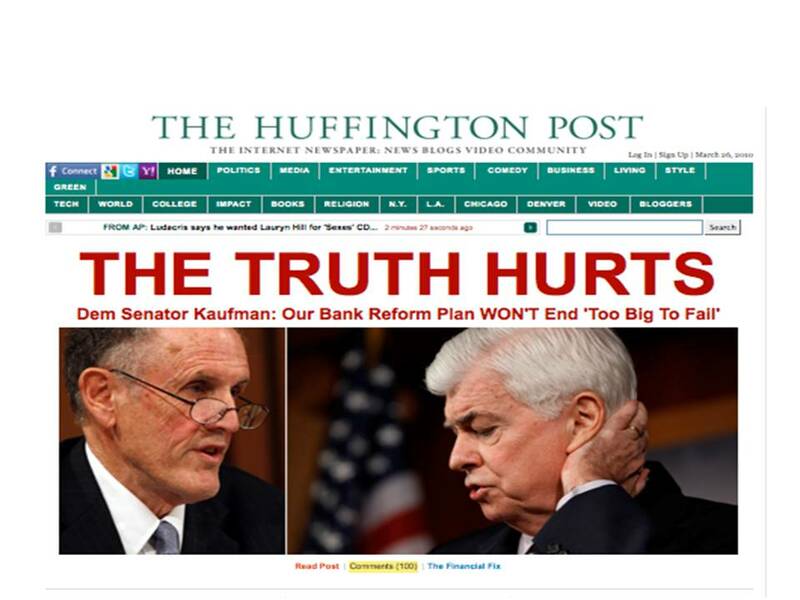 But the really, truly fascinating aspect of the Dodd bill is the fact that it continues to permit banks to lie to their customers. Of course, the people who are lied to are the small fry onto whom the big shots like to dump their toxic or dog assets. Will this be the first time in human history that legislators quite openly acknowledge what we’ve suspected for centuries, that the elites (financial elites in this case) have gamed the system to benefit themselves at our direct expense and we should just learn to like it? Equally fascinating is that this gets so very little attention. I suspect the other elites–particularly media elites–just don’t see this as a big deal. And I suspect that this is because they see the positive value (for them) in being able to herd public opinion, whether it’s by distraction, inattention or outright lies. The media examples are pretty obvious–the media bandwagon before the Iraq war, embedding during the war, years of inattention before the tech bubble burst, years of inattention before the housing bubble burst. Schumer is a well known double speaking crook who is in the pockets of the Big Financial Institutions. Never trust a guy from NY. 1) We have thousands of banks. We don’t have to create new one’s to absorb the excess, the one’s that already exist will simply grow larger. 2) Banks don’t have to be merged wholesale into another bank. Smaller banks can get pieces and remain under $250b. The media are all either owned by big corporations or indirectly financed by their advertisements. For instance, I noticed here in CO even the weather report cannot be trusted because it is financed by the ski resorts. Best to get your news from the Huffington Post. When you talk about who is lied to and imply who benefits from the association with the financial industry, I think I have heard the answer. There was a study or studies that have demonstrated how our elected officials have done amazingly better in their stock and bond investments compared with the average citizen. Some how this information does not correlate with the financial mess that this country is in. How is that our elected officials can outperform the average indices of the stock market? Is it insight or inside information that they benefit from? If it is insight, then I wish they would use that knowledge for the benefit of the financial health of the United States. If it is insider information then they should be thrown out of office. It is impossible for a financial system to never again put the country at risk. That pipe dream is not going to happen. dare i mention a reminder that this senator is from Connecticut and the corporate lobby holds a powerful sway in that state! but my question is, that if he is not running again, why doesnt he push for a better bill? As national political attention finally turns to financial reform, it is incumbent on well-informed participants to pronounce their views and suggestions for reform as clearly as possible. If the financial sector really does account for 30% of national corporate profits annually, this would seem to be a very high price for society to be paying for the ordinary re-allocation of funds throughout the economy. It seems tantamount to paying a 30% fee to get your paycheck cashed. Surely this kind of profitability is way beyond the value that banking contributes to our society and culture. It is obvious that “We the People” are really naive and ignorant. How is it that the people of this American republic are allowing an outgoing Wall Street kamikaze like Senator Dodd to orchestrate financial reform after receiving so much money from Wall Street? If there is a Senator more beholden to Wall Street than Mr. Dodd. show me. Mr. Dodd has a nice six figure salary awaiting him on Wall Street when he leaves office. Dodd has nothing to lose by sinking financial reform. Elizabeth Warren has a lot more credibility than Dodd right now. More pressure needs to be applied to Dodd, as he is too blinded by the same greed that permeates Wall Street. The big banks have $10T of miracle assets. There is no way to tell how much their assets are really worth. That was the reason for repealing marked-to-market and adopting marked-to-fantasy. These are fantasy valuations. The recent big profits come entirely from the carry trade, not from improving quality of the assets. Any meaningful reform should be preceded by a real audit. The case for big banks is generally that they need to be big to compete against big foreign banks in the international market. There is some truth to that. While there may not be any economy of scale past $100b for the core domestic banking products, in the international markets big banks have an advantage because their size is viewed as an indication of safety and soundness (including implicit government support). The problem is that banks haven’t been reporting a true picture of their risks and financial health: off-balance sheet assets, derivative transactions, accounting gimmicks, etc. The global financial system ground to halt not because Lehman failed but because the banks didn’t trust each other. The regulators have proven to be paper tigers because our political system can’t prevent regulatory capture. If regulation was comprehensive and the regulators could be trusted to do their job, we would just limit the size of the US market (which we do) and the banks can grow overseas as large as they want (in a responsible way). Then, no matter how big a bank became, the regulators would catch a problem quickly and unwind the bank efficiently. And so the choice boils down to: publicly funded elections and severe limits on lobbying and profiting from government service (which would benefit the country in other areas as well) or size limits on banks. As I’m not expecting that we will get the necessary political reform any time soon so I think it would be best not only to limit the size of banks but to separate commercial and investment banking (reinact glass stegal in some form). Investment/merchant bankers should not have the benefit of a government guaranty or leveraging a bank’s balance sheet. The off balance sheet complaint has been really working the fringes the last couple of years. Off balance sheet commitments are guarantees. Guarantees to repurchase an asset is contingent on events that trigger the obligation or liability arising to repurchase the asset. Similarly , for all kinds of transactions like Letters of Credit. How can you record an asset as your property that you do not own? Even if you did, how would you record it’s cash flow on your books. The cash flow of property you do not own and for which the conditions precedent requiring purchase do not yet exist. Perhaps the real answer is that no party anywhere may contract to guarantee the promises of another party? You want a locked down financial system? Then , prohibit guarantees. The problem is irresponsible cross guarantees and condition precedent dealing that may not ever be recorded on a set of financial statements. What must be recorded is the liability, gross or net, of transactions expected to become conditions precedent in the future. In short, the problem is the same as that facing insurance companies that record a discounted liability as a cost against premium income and set aside a statutory asset group as a reserve against future claims chargeable against the accrued liability. In short, the future claim is charged against the liability and is paid the claimant from the reserve asset. The problem with guarantees to buy an asset is that an added real problem is added. You are also buying an asset that has value. Now we have two major problems. How much do we accrue for the gross purchasees expected over time? The other problem is what is the value of assets recoverable over the same time. The net of these two items would be the reserve for losses on the guarantees made. A mass set of transactions. You simply cannot place an asset on your books that is not yet your property. Contingent liabilities would include future loss premiums on their health coverage chargeable by the insurance administrator. What would happen if to avoid a guarantee the insurance premium was set once and forever even though you know must cover even prior adverse conditions arising before you agreed to provide coverage? When in doubt make it massive and make sure all the other insurers understand the problem through your trade association. Off Balance Sheet liabilities are an actuarial problem and I doubt a real number is possible in many types of transactions. We live in far too massive changing circumstances for the actuarial number not be dealt a killer Black Swan. Off Balance Sheet problems may well doom the art of accounting given the complexity and ubiquity of contingent transactions today. N.B. this is exactly the same payoff gig Bob Rubin got from Citi. It made him $264 million in cash and stock over the next ten years, while Citi was drilling a black hole for itself and the country. Either we take hold of events, or those events will take hold of us. Yes on both counts. I’ve worked in media all my life. Because he wants a job with the corporate lobby, or some other highly compensated position in finance after he retires. These people never seem to disappear when they supposedly retire. Have we ever done #2 in the past? The only way to do that would be to have the FDIC or other resolution authority controlling the assets for a fairly large period of time. Say the assets are only $9T (a $1T hole today is a lot more than even pessimists believe). So now you have 36 banks instead of 40 – no real difference. As the Lehman post-mortem is showing, accounting rules were flaunted and there were probably a lot of laws broken. Accurate financial reporting is a necessary but not sufficient condition for a well-functioning financial system. One wonders if Dodd himself might be an appointee in the near future. I can see him heading the proposed CFPA, if Warren should not want that position. I could alo see him in a Fed post. I came to the conclusion that the Senate is way to comfy in it’s corporate relationships, but after the passage of HCR, I’m not so sure. The Senate is a tough read at th emoment. Good grief! How did the passage of HCR make you doubt that the Senate is way too comofy in its corporate relationship. The bill is a huge giveaway to the health care industry, and they participated actively in writing it. It doesn’t even remotely threaten their predatory business model and it hands them millions of new paying cusomters. The _insurance companies_ will have to make some adjustments to how they do business, but after a possible initial shakeout, they will be greatly enriched by HCR as well. Indeed, calling the bill Health Care Reform is positively Orwellian–it reformed nothing. It just put the existing system on steroids. Let me pose a simplistic question. I like your analysis that guarantees are basically actuarial problems. Then you go on to say that a real estimate of the expected liability is unobtainable in many cases. It seems to me that if there is no reasonable way to estimate the expected liability, then there is no reasonable way for a rational person to decide whether to issue such a guarantee, nor what price to receive for doing so. So this suggests to me that any guarantee for which a sound actuarial estimate cannot be made should simply be outlawed–no rational person would deal in them and they are clearly dangerous. Even if you don’t buy my argument that they should be outlawed, seeing some greater harm in limiting the use of guarantees, it seems to me that having a contingent liability yet showing nothing on your books about it is grossly fraudulent, and that practice ought to be banned. My own view is that securitization of both ends of a financial product leads to disaster. In simple corporate bonds there is one corporate issuer and many fungible buyers in the case of bearer bonds. In the case of a securitized mortgage there are many issuers if the retail borrower is the ” issuer” and many fungible buyers of a package of issuers. Here is an example of the problem of a guarantee of a product by repurchasing it. A single mortgage is resold to someone else subject to repurchase guarantee in the case of default. That mortgage carries with it the document package upon which the security interest and collection may be perfected. Five years later, the retail borrower defaults and the owner desires to make good. The final owner demanding repurchase is the tenth owner since it was sold by the guarantor. The tenth owner must provide a clear chain of ownership to enable me as the originator to repurchase the loan IN THE SAME STATE as I sold at other than balance presently due. That includes the expected standard of maintenance and lack of superior encumbrances destroying my security value. Every mortgage is a separate set of facts. In order to accrue a liability for expected future repurchased mortgages I must understand how to accurately estimate a group of mortgages that are individually unknown. The liability must include the expected cost of securing title to the security and collecting any other balance on the note if full recourse. Each will be presumed to be in a separate jurisdiction requiring individual costs incurred to collect the note. If I accrue a reserve for repurchase and there are imperfections in anticipating highly variable costs, my reserve is probably grossly understated. That means the very basis on which the mortgage was sold was defective and my defective accounting just tanked the company over the long term. Add in the Black Swan Event on a gross basis outside the parameters of the repurchase reserve and the whole excercise is an excercise in accounting futility. Accrue too much and you destroy the company. Accrue too little and you destroy the company. Compare this to the debentures my grandfather held in International Harvestor in 1925. They were unsecured. There was one debtor. The was a regular mass market for the debenture . His debebture was the same as every other debenture. In the case of selling a mortgage with a different and every owner in between my ownership and the guarantee claiming final owner is different because of imperfections they may impart to the documentation. There is no effective way to accrue a reserve. But, we are accruing for losses. The other aspect is just what would the total cash flow requirement be to actually buy back the guaranteed assets? This would be needed to establish a group of reserve assets from which the guarantee would be made good. Look at the huge problems of accruing costs to fund defined benefit plans where the problem is related to life tables and expected return on fund assets to establish the liability for funding to be made? This far simpler problem is our worst accounting nightmare. In short, mass securitization looks to be simply not within the realm of accounting ability. The liability cannot be estimated with enough certainty to be relied on in pricing the transaction itself or settling the transactions that actually ripen. Way to complex for an estimate that remains sufficiently accurate over the long term. Besides, in the modern first world economy, ability to pay requires a stable government policy over very long terms. Once settled politically an issue must remain settled. The American demos will never permit this unless dissent is ended. Decided must stay decided. New Yaawwk!!! Well let’s just be straight here and say Brooklyn. Certain sections of Brooklyn where they tend to be exceedingly intelligent and have large nasal passageways. Maybe David Gregory could act like a total a__hole and invite Rubin to come on the show, plug a book, and ask him “What should America do next?” like Gregory did with Greenspan and Hank Paulson. Gregory seems to like to ask the criminals who just left the robbery what the best course of action is. Ferdinand Pecora solved this problem 77 years ago for our fathers generation. Who do we turn to for protection of our children and grand children? Who in the senate will be todays Carter Glass? The text only hints at consumer protection. CFPA is mentioned without explanation. Just in case everyone forgets we are talking about the Consumer Financial Protection Agency. It is supposed to be the agency that protects the individual from the corporate financial vultures. Let’s have it loud and clear and totally independent, the Independent Consumer Financial Protection Agency. I came to the conclusion quite a while ago that the effectiveness of the bank rescue covered over the severity of the financial crisis so well that not much would be accomplished to avoid another, more severe crisis in the foreseeable future. The best result from the financial crisis is that we did not elect the dunce team of McCain/Palin/Graham. Think how much fun life would have been if Lehman had held on for another six months. So… be grateful for small blessings. No, it would be that the taxpayer demands lending; therefore, the taxpayer is the backstop. Simon, you’re right on again. What is Dodd up to? The answer seems so simple and yet so far. Reinstitute Glass-Steagall, require that all balance sheets reflect the complete portfolios and assets of all banks and others, make all derivatives subject to full transparency, either eliminate CDS’s or require that they be subject to the same reserving as any insurance, and, most of all, before you even vote on passage of a bill, require that all of the TBTF’s be subjected to REAL STRESS TESTS with full transparency of each’s performance on them. Those measures and a cap on the size of any bank or other financial entity at 250B makes a lot of sense, but also require that there be a special fund (beyond the FDIC fund) accumulated by assessments against banks of over 50B to offset the cost of a failure. Also rule that if any bank goes into receivership that no foreign individual or entity may recover any value until all US creditors are fully paid. Mortgages here are just a single example of the complexities of combining securitized pools of mortgages into more complex groups like CDO’s . Mortgages are made for repayment over the effective earning lifetime of the debtor. The first assumption therefore is political stability of the economic assumptions at the time the mortgage was entered into. In this example, the assumption is that the state acts to achieve the official state goals of full employment embodied in the Full Employment Act of 1946, as amended. Obviously, as a grantor of credit being sold full recourse in the case of default over the say 30 year term of the mortgage, I am relying on the state to preserve the employment of the debtor I lent to and whose loan I am guaranteeing. Outsourcing must therefore be an adverse act against the state policies I relied on long term. Now , just how does an accountant factor in political instability and near civil war between political factions we have experienced for the last thirty years in a net liability accrual for future losses from guarantee’s against default? Even worse, how would I figure out what reserves should be maintained dedicated to having funds available to honor a guarantee repurchase at total value including accrued interest due the owner I am standing in for? Realistically, the numbers cannot be determined unless they are stabs in the dark. Look how poorly AIG , a 70 year old insurance company performed in assessing risk and fees for the Credit Default Swaps they entered into. They were so poor at risk assessment they failed in the mere act of not having assets to deposit with the counterparty as the contract progressed. If they were unable to even establish the right cash flow needs how incompetant would be the accounting for setting liability accruals on the entire contract as it progressed? Might the real answer be that the bigger the institution, the dumber the big wig at the top from a functional perspective. Compare Richard Fuld to John Paulson as an example. My bet is Paulson would have been unable to hold on at Lehman in Fuld’s position and Fuld would not have been able to duplicate Paulson in Paulson’s position. I suspect both are about equally smart. We have broken up many too large corporations and monopoly’s in the past. Allowing the banks to fail first,like this bill does,then pick up the pieces is just fixing a symptom to a much larger disease. Was this before they were elected, or after? In other words, were their superior investment returns the results of their relationships and acumen during their time in the private sector, or after they entered public service? Financial reform is already following the bad joke currently sold as HCR. Obama touts the Volcker Rules, just as he touted single payer and neither made it as far as draft legislation. HCR took 13 months to accomplish what should have done on a weekend by amendments to existing legislation. Financial reform won’t be any different. Are we basically looking at a newer and grander version of the mortgage meltdown on steroids with all the 600T interest rate swap notional values out there that were peddled by snake-oil Wallstreeters to overextended cities, states and countries ala Greece and California with fineprint that leaves them with all the risks and facing ballooning costs? How do we put the brakes on that with financial reform? Yes, and that proves what everyone has been saying – the central tenets of HCR were republican ideas from the get-go.